India's largest telecom company Reliance Jio has launched WhatsApp on its Jio 4G smartphone. Now you can easily enjoy your live phone WhatsApp. 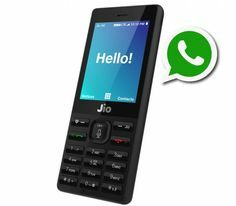 Started people were wondering if Jio would make a smartphone. Peoples are waiting now to be able to send live chats, photos, videos, etc. all over the Whatsapp even with the phone from your phone. With this, Jio has added two more new features to the phone to make its smart. Whereas the first phone had to face a lot of difficulties due to lack of file manager, then now the problem has been removed by Jiao. With the new update, Xiao's phone has been given the feature of File Manager. To install WhatsApp on the Jio 4G phone, you first need to update your phone by going to the device option by going to your phone settings. When your phone is fully updated, then you have to go to PlayStore in Jio Phone when you scroll down, you will see WhatsApp icon there. After that, you can install your WhatsApp by installing Whatsapp by clicking on Install. And you can easily use WhatsApp. In addition to Whatsapp, Jio has installed the file manager on his phone. With File Manager, you will be able to use your phone's storage and secondary storage (Micro SD card). Earlier, this facility was not on the phone. From which you did not use your phone's secondary memory properly. The whole team of Jio started to make the phones of Jio completely smart. Jio believes that he gets his client from every feature that is given to an expensive Android user. Jio has also made available the facility of Google Map in his phone. Which you can use during your journey. Google Map will prove very prominent in Jio phone.